Scientists from NOAA and the Bishop Museum have published a description of a new species of butterflyfish from deep reefs of the Papahānaumokuākea Marine National Monument in the remote Northwestern Hawaiian Islands. The study was published today in the scientific journal ZooKeys. 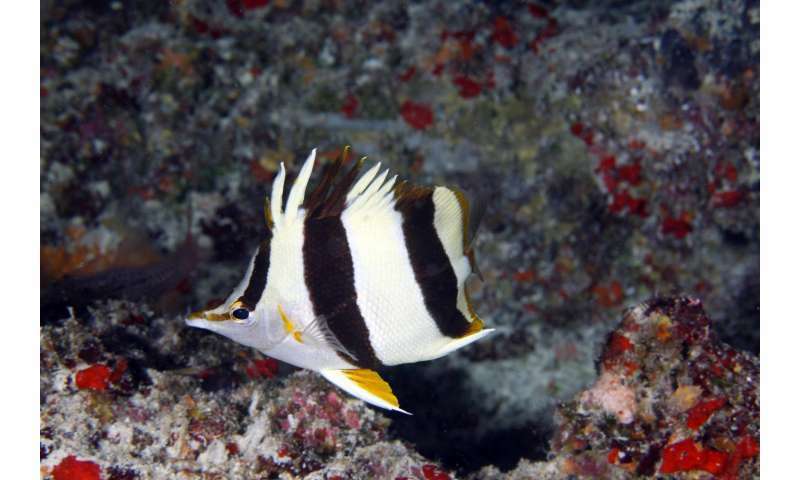 "Butterflyfish are the glamour fish of the coral reefs," said Richard Pyle, Bishop Museum scientist and lead author on the publication. "They are colorful, beautiful, and have been very well-studied worldwide. Finding a new species of butterflyfish is a rare event." Deep coral reefs at depths of 150 to 500 feet, also known as mesophotic coral ecosystems or "the coral-reef twilight zone," are among the most poorly explored of all marine ecosystems. Deeper than most scuba divers can venture, and shallower than most submersible-based exploration, these reefs represent a new frontier for coral reef research. "Discoveries such as this underscore how poorly explored and how little we know about our deep coral reefs," said Randall Kosaki, NOAA scientist and co-author of the study. "Virtually every deep dive we do takes place on a reef that no human being has ever seen." This species was first observed in video taken from manned submersibles more than 20 years ago, at depths as great as 600 feet. At the time, Pyle and University of Hawaii marine biologist E.H. "Deetsie" Chave recognized this as a potential new species. However, because of the extreme depths, it was many years before technical divers using advanced electronic closed-circuit rebreathers were able to collect and preserve specimens in a way that would allow proper scientific documentation as an undescribed species. President Obama announced on August 26 the expansion of Papahānaumokuākea Marine National Monument by from 139,797 square miles to 582,578 square miles, making it the largest marine protected area on Earth. "This new discovery illustrates the conservation value of very large marine protected areas," said Kosaki. "Not only do they protect the biodiversity that we already know about, they also protect the diversity we've yet to discover. And there's a lot left to discover." Papahānaumokuākea is cooperatively managed to ensure ecological integrity and achieve strong, long-term protection and perpetuation of Northwestern Hawaiian Island ecosystems, Native Hawaiian culture, and heritage resources for current and future generations. Three co-trustees - the Department of Commerce, Department of the Interior, and State of Hawai'i - joined by the Office of Hawaiian Affairs, protect this special place. Papahānaumokuākea Marine National Monument was inscribed as the first mixed (natural and cultural) UNESCO World Heritage Site in the United States in July 2010. For more information, please visit http://www.papahanaumokuakea.gov.